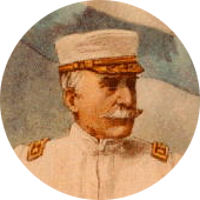 Admiral Dewey was the captor of Manila during the Spanish-American War. Admiral Dewey is the only person to ever attain the rank of Admiral of the Navy, the highest possible rank in the United States Navy. 1 New England Historical and Genealogical Register, (New England Historic and Genealogical Society), 1982, Vol. 136, p. 314. 2 Dewey, Adelbert M., et. al., Life of George Dewey, Rear Admiral, U.S.N., and Dewey Family History, Westfield, Massachusetts: Dewey Publishing Company (1898), 576, 683, Ancestry.com (Online Database). 3 Goodwin, John Samuel, comp., The Goodwins of Kittery, York County, Maine, Chicago: Orrin Sheller Goodwin, Printer and Publisher (1898), 40-41, Hathi Trust Digital Library. 4 Roberts, Gary Boyd, Notable Kin, Volume 2 , Santa Clarita, California: Carl Boyer, 3rd (1999), 186. 5 Wikipedia, "George Dewey", (accessed 03/12/2017).